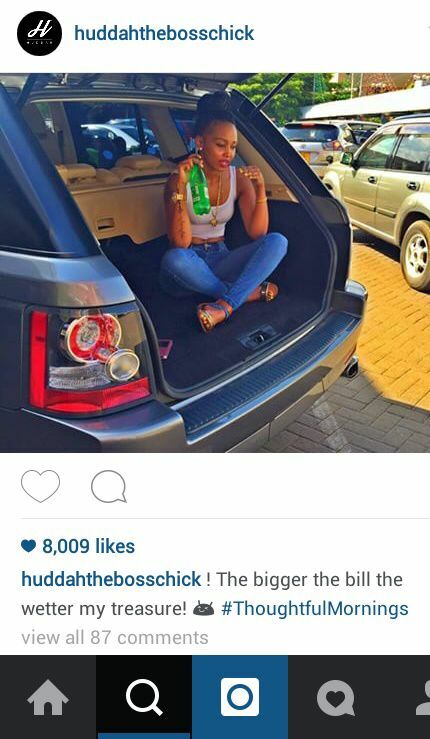 When it comes to Socialite Huddah Monroe, controversies are a norm. After being exposed for being a high end prostitute a few months ago, the socialite seems to be confirming the allegations herself. In her recent Instagram post, she mentioned what seems to be an advert for her ka thing to the highest bidder. Sitting inside the trunk of her Range rover, holding a drink , she captioned "the bigger the bill, the wetter my treasure" I wonder what kind of a jerk would want to pay millions for that public thing, anyway here is the photo.